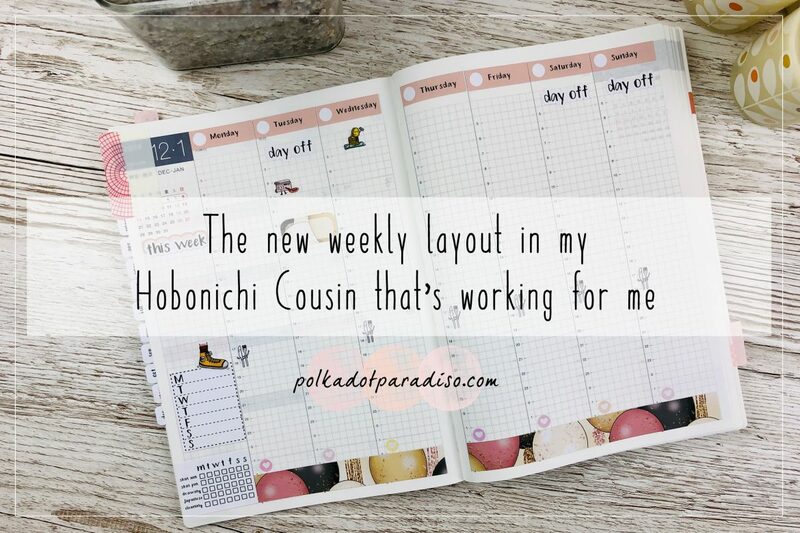 My weekly layouts always looked the same and they kept me pretty on track with life. I’d been in the Cousin for around 9 months, and was pretty happy using it. Weeks like this were pretty typical. However, I was starting to grow tired of how haphazard each day looked. Some days I felt like I had too much space, others because of how I’d set up plans at the start of week, felt like they were squeezed. I decided to try giving some order to my weeks and block out the days for specific things. What did I want to go in my planner each day? First things first, if I was going to organise these pages a bit better I needed to have a think about what I wanted on them each day. I set about making a list of everything I’d want on them. I then roughly worked out how much space I would need for each thing. I did this based on the hours down the left hand side of each day. Next I redid my list with the hours/space I thought each would need. I then set about planning my first week in this way. First I start with using the left sidebar for all my big tasks for that week. Any posts that need writing, any life admin etc. Next I add in any events for that week in the top of each day. Appointments, birthdays that kind of thing. Then I added any regular stickers. For example on this spread, the icons I use to denote Instagram posts, the cute little calorie with cutlery sticker for food intake and the trainer for steps. I then start populating each day further. Tasks that need to be done on specific days, my social media planning, cleaning that I want to do on each day etc. Then as the week goes on I keep filling it in with anything new that comes up. This worked well for a couple of weeks but I decided I wanted it to look cleaner and so in the third week, I added thin washi. I didn’t use it to break up every section but I liked how it added a bit more order to the days. The following week I wanted to try breaking up each section individually and used fineliners to do that. The pastel Stabilo fineliners were perfect for this. Instead of using lots of the same stickers each day I switched out using the sidebar for the week’s tasks, and instead used it as a bit of a key. I really liked this idea but missed the sidebar. So the following week I moved over the key slightly so I could utilise the sidebar for my list of photographs I needed to take that week. Instead of writing my big tasks in one place, I just spread them out over the days unless they were day specific, in which case they went on the correct day. On my monthly pages I have a running list of anything big that needs to happen that month anyway so putting it in my weekly sidebar did feel like unnecessary duplication. Each week I’ve also been adjusting what goes on the pages, and how much space I give to them. Steps and food tracking has now moved into my Weeks and been replaced with skincare notes. Events and cleaning have been given more space each day. I’m really enjoying this way of laying out my weekly pages. They just look clean, and ordered and help me feel much more organised. It’s crazy that it should make me feel more organised but I’m a big advocate of ‘tidy desk, tidy mind’ and I think this follows through into my planning. Tidy planner – tidy mind. If you want to see how this layout evolves over time, be sure to follow me on Instagram!